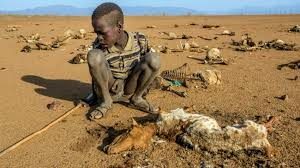 “According to a monthly report from the World Meteorological Society, this past March was the world’s second warmest on record, continuing a trend of record temperatures in the past several years. 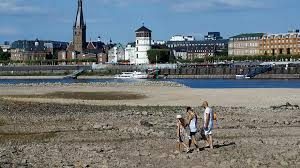 “In some areas of eastern Europe temperatures soared to as much as 3 degrees Celsius over average temperatures logged throughout the last 30 years while temperatures in Australia rose to their highest ever recorded in March. 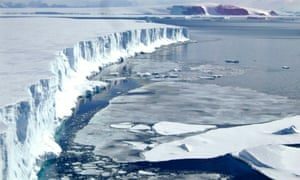 “Two-thirds of the ice in the glaciers of the Alps is doomed to melt by the end of the century as climate change forces up temperatures, a study has found. 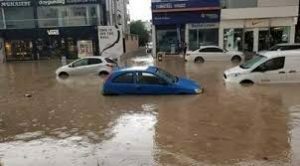 “Cyprus has already experienced the second wettest seven months since 1901, and with more rains forecast over the next two weeks, the bets are on that the year’s rains may match the record year of 1968/69. 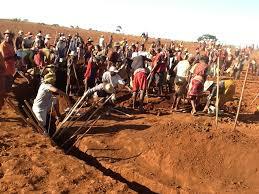 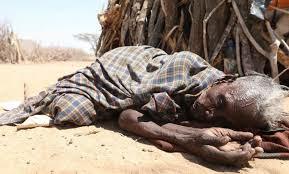 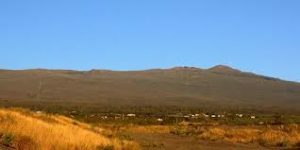 “Millions of Kenyans are in the grip of an unprecedented and devastating food crisis. 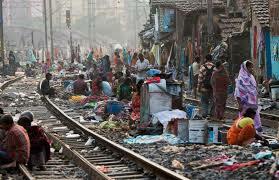 “Indians are beginning to feel the pinch as temperatures soar across the country. 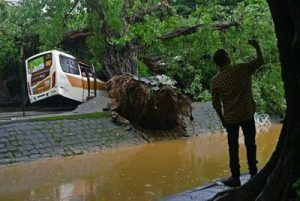 “The number of people killed after days of torrential rain triggered flash floods and landslides on Indonesia‘s Sulawesi island has climbed to 59 with 25 others missing, a disaster official said Friday. 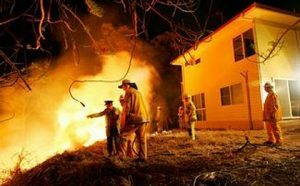 “More than 20 former fire and emergency chiefs from multiple states and territories say Australia is unprepared for worsening natural disasters from climate change and governments are putting lives at risk. 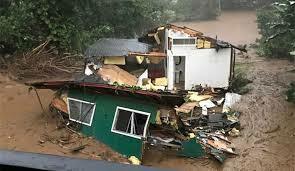 “”I’ve never seen or witnessed anything like this. 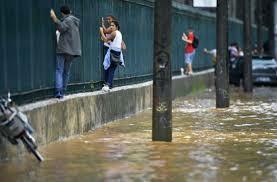 I’ve seen it happen elsewhere but never here,’ Guillerme de Oliveira, 59, told AFP. 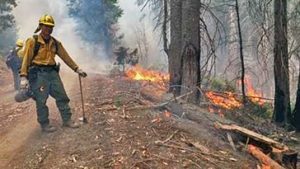 “Fires like the one that razed Paradise in November burn thousands of pounds of wiring, plastic pipes and building materials, leaving dangerous chemicals in the air, soil and water. 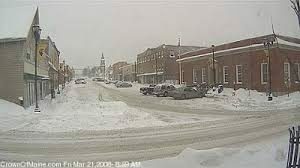 “It’s been a rough winter in Caribou, Maine, and as a result, another weather record may soon fall here. 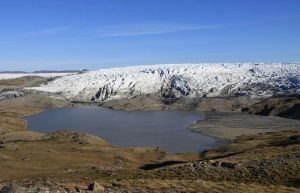 “Earth’s glaciers are melting much faster than scientists thought. 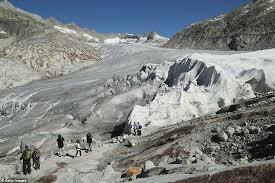 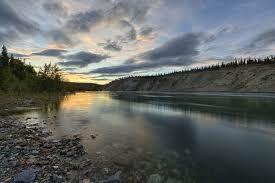 A new study shows they are losing 369 billion tons of snow and ice each year, more than half of that in North America. 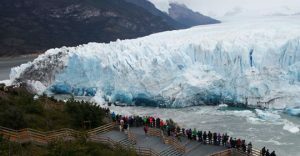 “The most comprehensive measurement of glaciers worldwide found that thousands of inland masses of snow compressed into ice are shrinking 18 percent faster than an international panel of scientists calculated in 2013. 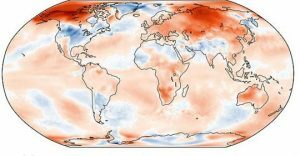 “Unusually high March temperatures lopped weeks off Alaska’s long winter and reflect a warming climate trend, state climate experts say. 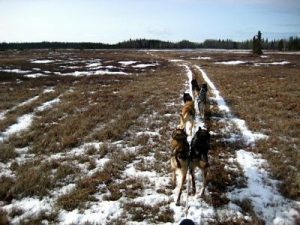 March is normally reliable for dog mushing and cross-country skiing. 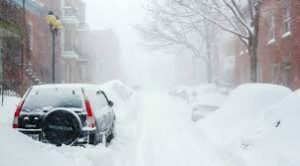 “”An atmospheric blocking pattern [eastern Canada] will develop and persist through at least April 20th,” says Weather Network meteorologist Dr. Doug Gillham, who calls the pattern “eerily similar” to both last April and April 2016. 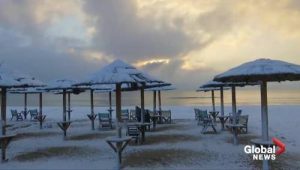 “Old Man Winter isn’t giving up without a fight. 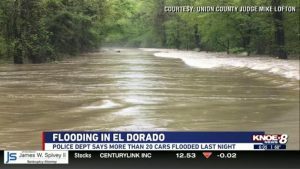 “Severe weather hitting the Arklamiss [Arkansas] over the weekend. 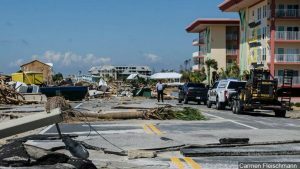 “A combination of record rains in 2018 and hurricane damage appears to have thrown the wetlands out of balance, with ponds, lakes and streams rising, particularly in Washington County, Florida. 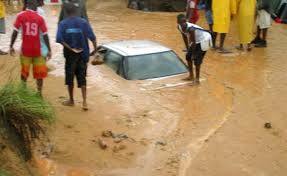 In some areas, particularly around the ponds, residents say it’s the highest they have ever seen it. 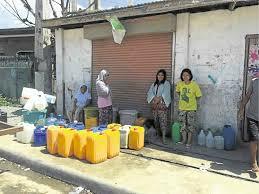 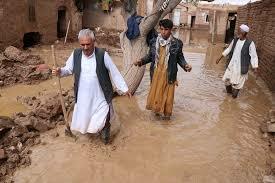 “On local television, neighborhoods in the southern zone, the most affected, were completely flooded by rain. 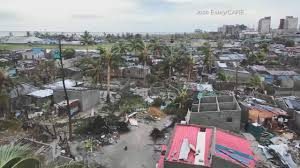 ““Risks include drought conditions that could curtail agricultural output, especially if the country’s grain-growing counties are affected,” the bank said. 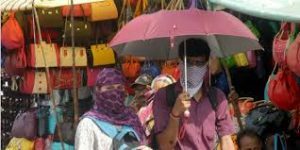 “Khargone in West Madhya Pradesh recorded the hottest day-time temperature of 44.5°C on Monday. 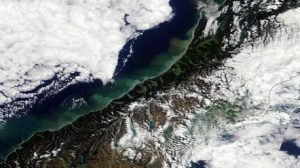 “Some of the rubbish spilling out into the Tasman Sea from an old rubbish dump on the West Coast will not be able to be collected, scientists say. 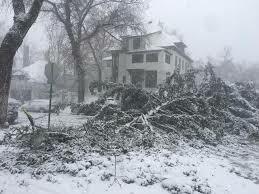 “Just three weeks after one of the most intense storms on record pounded the Plains and Midwest, another “bomb cyclone” of similar strength is in the forecast. 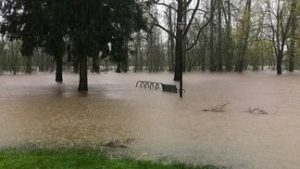 The spring storm seems poised to dump even heavier snow and could be followed by another round of significant river flooding. 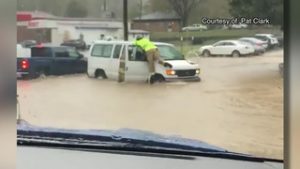 “The slow-moving system that just generated almost 200 reports of damaging storms produced two tornadoes in Texas and one in Mississippi in addition to flash flooding up through Arkansas, which at one point saw 8 inches of rainfall over a very short time period. 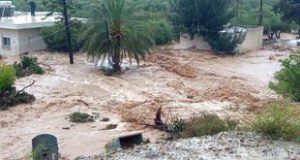 “According to the National Weather Service, Kauai’s north shore received almost 50 inches of rain, setting a new national record for most rainfall within a 24-hour period. 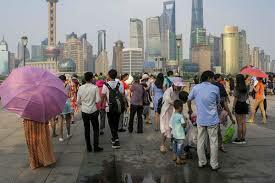 “The temperature in downtown Shanghai on Sunday climbed to 30.5 degrees Celsius, making it the hottest April 7 since the city’s meteorological records began in 1873. 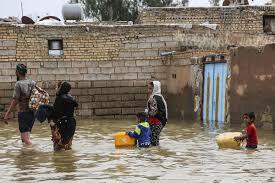 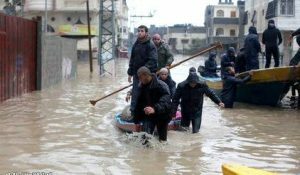 “Authorities in Iran are evacuating six more towns in the flood-hit south-western province of Khuzestan, Iranian state TV has reported. 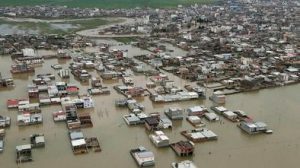 Gholamreza Shariati, the provincial governor, said rescue teams were taking residents to nearby shelters on Saturday, including three army barracks. 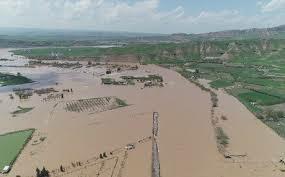 “Kurdistan Region – High water from heavy rains and overspill from Dukan Dam has swept away tourism infrastructure along the Little Zab River. 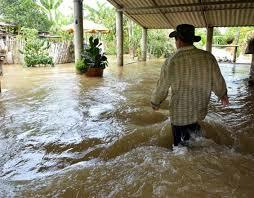 Further downstream, hundreds of people have been evacuated and aid agencies report problems accessing flooded areas. 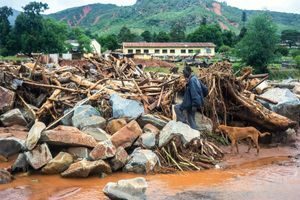 “Hundreds of thousands of people are in need of food, water and shelter after Cyclone Idai battered Mozambique, Zimbabwe and Malawi. 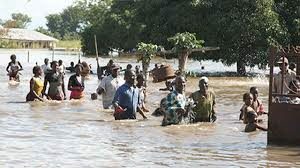 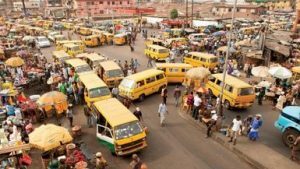 “Nigeria has been in the grip of an intense heatwave over the past few weeks, with meteorologist saying there is no relief in sight until the seasonal rains set in next month. 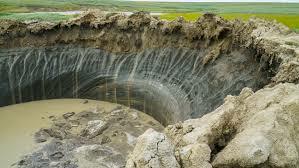 “…in 2013, the outlet glacier of the Vavilov Ice Cap began sliding at an unbelievable pace. 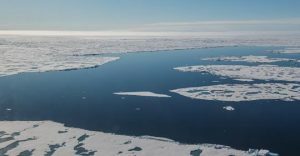 “Severe and erratic weather patterns across the world could be down to increasing air temperatures in the Arctic, according to new research. 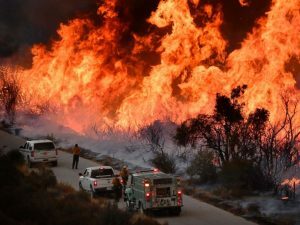 “South Korea has declared a national emergency in response to one of the largest wildfires on record. 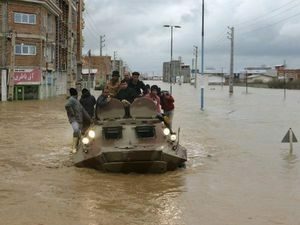 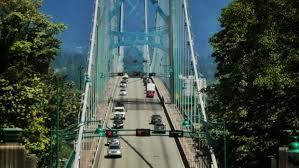 “At least one person has died and more than 4,000 people have been evacuated. 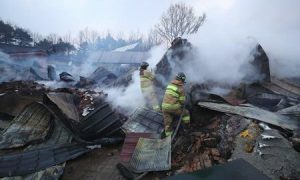 “Thousands of soldiers have been helping firefighters from across South Korea extinguish the flames in the country’s north-eastern mountainous region, close to the border with North Korea. 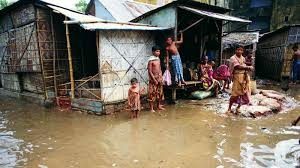 “One of the consequences of Bangladesh’s long struggle with the elements is a spike in the number of families leaving rural areas and heading for major cities such as Dhaka and Chittagong, where children’s rights are frequently violated. 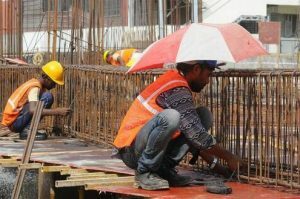 “For more than a week, parts of India have been gripped by a heatwave that has sent temperatures soaring up to six degrees Celsius above average. 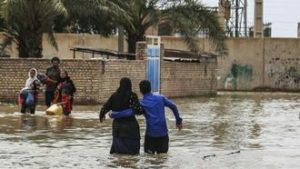 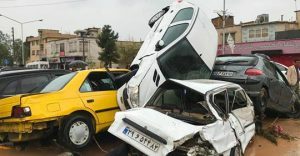 “An Afghan official says at least seven people have been killed as heavy rains and flooding swept through the country’s western Herat province. 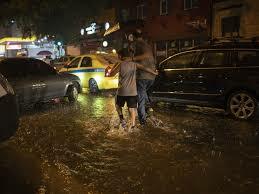 “Rescue operations are under way across Iran as the death toll from severe flooding has reached more than 60. 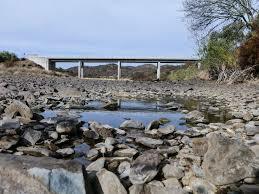 There are new warnings that dams in some areas could overflow, causing more devastation. 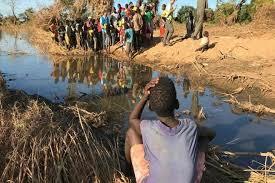 “As part of a report on the severe drought blighting Madagascar, Aid-Zone spoke to health workers and locals in the south of the country about the daily challenges they face. 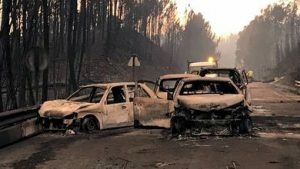 “Alarm bells are already ringing as at least ten reservoirs are currently less than half full, a third of the country is in a state of severe meteorological drought, and swathes of southern Portugal are already experiencing extreme meteorological drought. 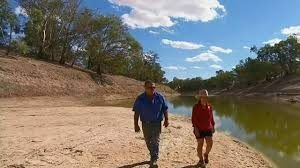 “Communities along the Darling River in Australia are on the verge of collapse as the long-term drought continues to dry up the waterway, which hasn’t flowed for more than 200 days. 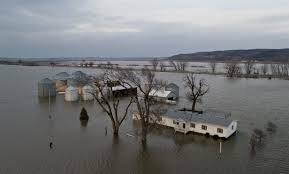 “Record-shattering floods across the Midwest have devastated parts of the region, with thousands of residents now facing a long and expensive recovery. 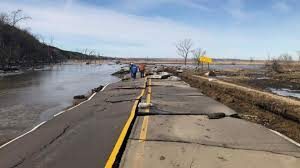 “Much of Saskatchewan experienced the driest March on record, with only four per cent of the normal precipitation falling in Regina, according to data from Environment and Climate Change Canada. 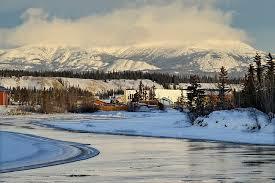 “Falling snowflakes in the Arctic are trapping extra heat, which could be enough to speed up the melting of sea ice. 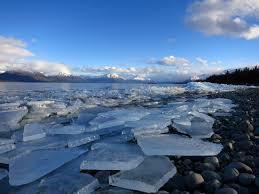 The effect could mean Arctic seas become ice-free up to 20 years earlier than expected. 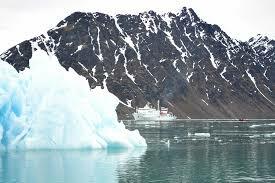 “The dramatic loss of ice in the Arctic is influencing sea-ice transport across the Arctic Ocean. 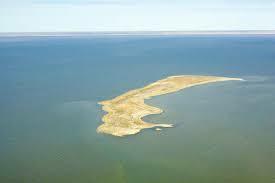 As experts from the Alfred Wegener Institute, Helmholtz Centre for Polar and Marine Research report in a new study, today only 20 percent of the sea ice that forms in the shallow Russian marginal seas of the Arctic Ocean actually reaches the Central Arctic, where it joins the transpolar drift; the remaining 80 percent of the young ice melts before it has a chance to leave its “nursery.” Before 2000, that number was only 50 percent. 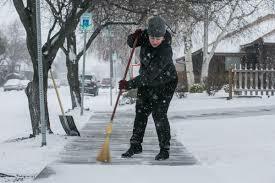 “Yakima, Washington, experienced the coldest March on record, according to data from the National Weather Service. 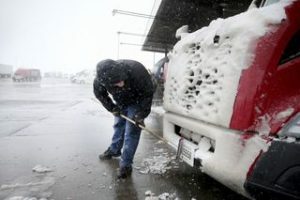 The average temperature was 35.9 degrees at the Yakima airport, which was 7.3 degrees below normal. “Floods, droughts, heatwaves and other climate-related extremes caused economic losses of €453 billion between 1980 and 2017, claiming the lives of more than 115,000 people across Europe. 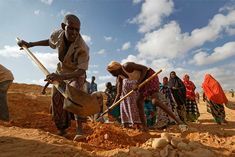 “UK Food prices rose at the highest rate for nearly six years in March, data showed on Tuesday, as increased commodity prices and adverse weather took their toll. 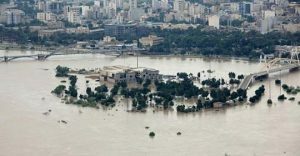 “The death toll from major floods in Iran over the past 15 days has risen to 62, the head of the Iranian Legal Medicine Organisation has told local media. 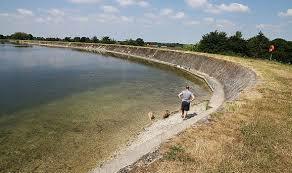 “Many states across India are rapidly coming under the influence of heat waves. 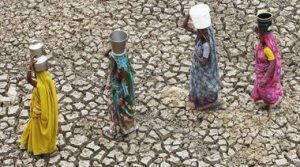 “About 42 percent of India’s land area is facing drought, with 6 percent exceptionally dry–four times the spatial extent of drought last year, according to data for the week ending March 26, 2019, from the Drought Early Warning System (DEWS), a real-time drought monitoring platform. 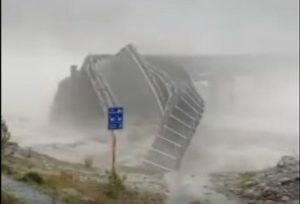 “Rainfall from ex tropical cyclone Trevor continues to travel south through South Australia’s channel country rivers and is expected to cause major flooding, according to the Bureau of Meteorology. 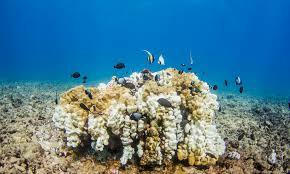 “Events linked to global warming have damaged the Great Barrier Reef to such an extent that the ability of its corals to recover from shocks has been severely disrupted. 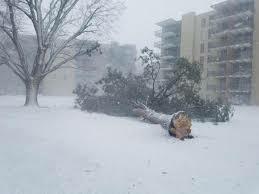 “Trees growing near the South Pole, sea levels 20 metres higher than now, and global temperatures 3C-4C warmer. 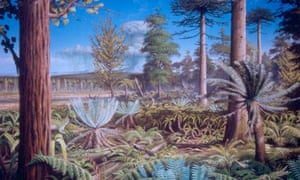 That is the world scientists are uncovering as they look back in time to when the planet last had as much carbon dioxide in the atmosphere as it does today.